Safariland holsters are known around the world for their quality and durability. The model 518 Safariland Paddle Holster is no exception. It is a suede lined, custom formed, thumb break holster. Its medium to hi-ride carry, wraparound design, and user-adjustable tensioning device provide excellent weapon retention. This Safariland paddle holster is thermal molded from Safari-Laminate® and features a wide, suede covered, self locking polymer paddle-making it lightweight, durable, and comfortable. The Safariland objective is to provide the tools to do that job better and safer, whether it's Safariland holsters, duty gear,or complete line of accessories. Known around the world for their law enforcement products, they are taking the knowledge gained to manufacturer Safariland holsters into the civilian market. Ordered this for my Smith And Wesson 4553TSW w Rail. Finding a holster for this gun is no easy task-almost down right impossible. Excellent as holsters go for this gun.For my fellow "old schoolers" still on duty who carry this gun, the holster for the Smith And Wesson 4513TSW-W RAIL (which is what I had to settle for) fits this weapon (4553 TSW-W RAIL). 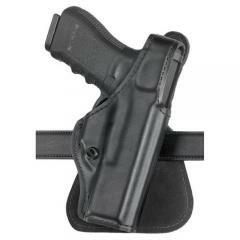 Excellent holster Very Secure Very Safe-Great Fit on the Garrison Belt. Very good paddle holster comfortable-great retention. Great quality, fits my Kahr K9 like a glove. It's great, but still needs to be broken in. I'm going to order one for my Glock 22-.40cal. Very nice holster. Top quality. I did haft to modify the hole on the back of it though. The hole was not cut large enough where the belt clip is located so the paddle would not close when I anchored the holster to my belt but after I cut the hole to the proper size it works very well. I have always been a fan of safriland products, & will continue to purchase them. I've found out of all the paddle holsters I've tried the model 518 is the most comfortable. It has a longer and wider paddle which makes it a much better concealed carry holster. The quality is exceptional. My pistol is secure and tight, I adjusted the tension and I can draw my gun and still have no slop in the holster, great item, I recommend this holster. Comfortable, secure and easy to take off when sitting at the desk. Holster is extremely functional and looks great. Extremely well made. Comfortable and convenient. Holds weapon securely. Great holster. At this time we do not have anything made specifically for the PT 840. It was replaced by the 247 series which are very similar and might work with your gun.